Hogenakkal Falls located in Dharmapuri district of Tamil Nadu is often referred to as Niagara of India. At Hogenakkal, the river Kaveri creates numerous waterfalls which is treat to watch. I visited this water falls few years ago with my friends and I wanted to show the beauty to Thilak, but this trip was a major disappointment for us. Since we did not have any plans for this weekend, we decided to go to Hogenakkal. We did not plan like how we do normally. However, we decided on two things. First, mode of transport will be bike for this 300 km ride (to-and-fro), instead of train, bus, or car. Second, we decided not to take the usual highway route. Our finalized route was the less taken route of Kanakapura road. The most traveled route from Bangalore to Hogenakkal is: Bangalore > Hosur > Krishnagiri > Dharmapuri > Hogenakkal. Though it is a longer route (174 km), since you can travel in AH 43 (a well maintained National Highway) till Dharmapuri, people prefer this route. Because of this highway, lesser time is enough though the distance is longer. But, for both of us, highways are boring. So, the route we chose was via Bangalore > Kanakapura > Anchetty > Hogenakkal. We were sure that the road till Kanakapura is well maintained, but we were not sure of the road after that. At 8 AM, we started our bike trip and reached Kanakapura at 9 AM. Had breakfast at Udupi restaurant which you will get as soon as you enter Kanakapura and started from there at around 9.45 AM. 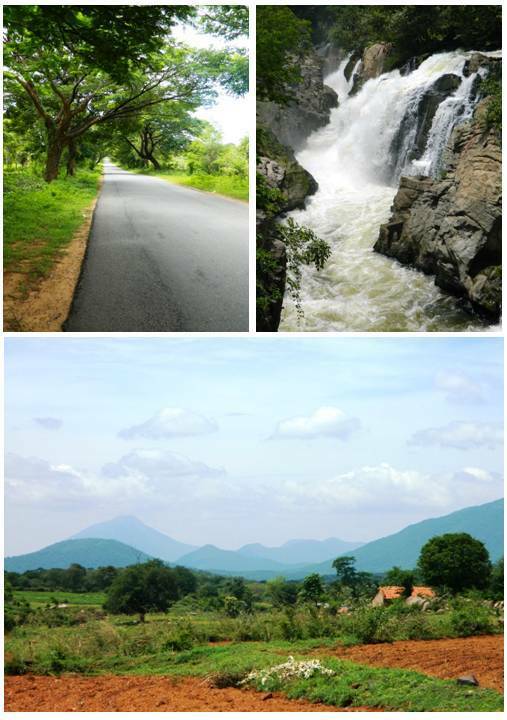 The road leading to Hogenakkal from Kanakapura was very scenic and absolutely traffic free after few kilometers. It goes through many small villages and on both sides of the road, one can find vast lands. Both of us felt very happy for choosing this road and for choosing to come by bike. The road was in a very good condition. After few kms, we crossed Karnataka border and entered Tamil Nadu state. The road continued as picturesque as before. In addition, we could see large mountains at the other end of the fields. Hardly any vehicle was travelling in that road. We both absolutely loved the ride. After some distance, the road took a different terrain and we were travelling in the middle of a forest. This terrain was only for a small distance and again the lonely road continued through small villages. After crossing Anchetty, when we were nearing Hogenakkal, there was a small ghat section. The view from this place was amazing. It was around 12 noon when we reached Hogenakkal. If not the numerous breaks that we took, we could have reached the place an hour before. But, the journey was worth taking breaks. Just 1 km before you enter the town, you have to pay 10 Rs as entry fee. We parked the vehicle in the parking area near the bus stand (parking fee for bike is 20 Rs) and proceeded towards the falls. The temperature was around 32 degree and was not that humid. I was highly excited to show the beautiful falls to Thilak, but we did not know that a major disappointment was waiting for us. It was crowded where there was an arrangement for the people to take bath. Hogenakkal is famous for oil massaging and boat rides. There were many people taking oil massaging, but what surprised me was the missing of coracle riders. When we went near the main area, we could see that, almost everywhere the entry was restricted. It was not like this when I visited few years before. We assumed they might have altered the route to go to the main falls. But, when we enquired the local shop guys, they informed us that the entry is restricted everywhere and coracle ride is banned because of some major accidents happened recently. We double checked with few others and got the same information. Only place that we could visit was the hanging bridge. From the hanging bridge, the view of the falls was mesmerizing. Thilak felt happy to see that itself, but I felt saddened to the core. Last time, when we were here, we went near the falls which we were now seeing from a distance. What disappointed more was the restriction to the main falls. The main falls was justifying the reason why it was called Niagara of India. It was that beautiful and it was main attraction of Hogenakkal. We wondered how they could restrict the access to the main attraction. But, we did not have any other option, but to have lunch and return from there after watching the falls from hanging bridge. The only restaurant nearby that looked good was Hotel Tamil Nadu. The food was not good at all. After having normal south Indian meals, once again we went near the main area to see if there is any place where the entry is open for the main falls. But, we were out of luck. At around 2 PM, we escaped from there. The weather was extremely hot and riding the bike gave us heavenly feeling. While returning, we chose to come via Rayakottai > Hosur route (around 150 km) just to avoid highway and to make this a round trip. This route also was beautiful, but not as scenic as the route that we took for our onward journey. And also after some distance, the road was not that well maintained and it was bit crowded. But, we enjoyed the ride. Both of us were tired a lot because we were not used to traveling such a long distance in bike and the sunny weather was making our situation even worse. We took many breaks in between and reached our home at around 6.30 PM. After reaching home, we read the news about the reason behind high security in Hogenakkal today. The reason was: Just 2 weeks before, six members of a Chennai family, including two children were drowned after a coracle ride capsized in Hogenakkal. This happened because of the coracle rider’s carelessness. Though we were disappointed at the Hogenakkal falls, the bike ride through different landscapes gave us an unforgettable experience. 1. Be extra careful if you are opting for a coracle ride. Wear life jacket while going in a coracle and DO NOT allow the rider to include more than 6 people into a coracle at a time. 2. Before visiting Hogenakkal, get the information if you can visit all the attractions without any restriction. I have read in many blogs that most of the times the entry will be restricted due to major accidents. Can you please tell whether the car driving will be good the road you took. (Kanakapura -Anchetty road). Was planning last week but could not make it. Read about the incident happened in Hogenakkal Waterfall in the magazine.Very sad. The car driving will be good on Kanakapura-Anchetty road, but be careful on the narrow curvy roads. Traveling in a non-sunny weather will make the journey more pleasant. Before going to Hogenakkal, please get the information if you can visit all the attractions without any restriction. I have read in many blogs that many a times the entry will be restricted in this place due to major accidents. Lovely post! I really enjoyed reading about this because I did not know about it at all! Glad that you liked the post.. thanks for visiting.. Thanks for reading.. pics on your blog are very nice. Great.. hope you had a nice time there.. I been to Hogenakkal. The area was really good but people who take you on the coracle ride was very rude – they were money-minded. And they also didn’t have the sense to keep the area clean. I was really upset by that. Would love to go for a coracle ride there! Thanks for reading. Coracle ride is too good there, but make sure of your safety. Hi there! This is such good information! And though you didn’t get to see the falls up and close, you enjoyed the trip which is the good part :-). Nice post. What a wonderful description. I truly felt your disappointment but more than that I am inspired to visit the falls on my next trip to your city and I will certainly take the scenic route. Thanks for visiting my blog. I’m gong to be writing more posts about Shillong which will contain all the information you asked for. I visited this place long back and the main attraction is indeed the coracle ride and the main waterfalls. Disappointing to hear that they are not accessible now. I can imagine your disappointment. Yes.. that was very disappointing for us.. hopefully they will take the necessary security measures and allow the access soon.. thanks for reading the post.. Yes, they should take some security measures and allow the access. They can’t shut down something quoting a mishap, forever! Yeah .. the ride was awesome.. Glad that you liked the post. Seems like a very nice place. Love this post!